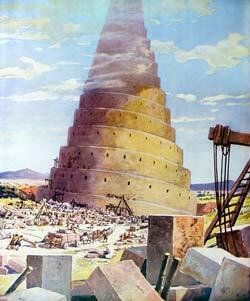 The term "Babylon" comes from the word "Babel" and it signifies confusion. The English word "babbling" is also derived from the same. "Babylon" is used by the Bible to refer to a false, man-made religious system. Genesis chapter 11 records: how the vast majority of the world did not believe God's promise to never completely destroy the earth again by a flood; how they rejected God's instructions to spread across the earth; and how they chose to glorify themselves rather than God. These rebellious 'Babel' builders chose to dwell together in a large city where they united in building a structure that would supposedly afford safety against further judgments from God for their disobedience. The 'Babel' builders substituted obedience to God for their own works. They attempted to save themselves in their rebellion by "building a tower to heaven." The Bible indicates that at the end of this world, 'Babylon," a false religious system, will attempt to decieve, and then force, multitudes into thinking that they too can disobey God and yet be saved. God indicates that at the very closing moments of time many of His true followers are associated with this false system of religion. God lovingly calls them "my people" in the final warning message of Revelation 18:4. In Revelation 14 the first angel is followed by a second proclaiming: "Babylon is fallen, is fallen, that great city, because she made all nations drink of the wine of the wrath of her fornication" (Revelation 14:8). The term "Babylon" is derived from "Babel," and signifies confusion. It is employed in Scripture to designate various forms of false or apostate religion. In Revelation 17 Babylon is represented as a woman - a figure which is used in the Bible as the symbol of a church, a vile woman, an apostate church. The woman (Babylon) of Revelation 17 is described as "arrayed in purple and scarlet color, and decked with gold and precious stones and pearls, having a golden cup in her hand full of abominations and filthiness:... and upon her forehead was a name written, Mystery, Babylon the Great, the mother of harlots." Says the prophet: "I saw the woman drunken with the blood of the saints, and with the blood of the martyrs of Jesus." Babylon is further declared to be "that great city, which reigneth over the kings of the earth" (Revelation 17:4-6, 18). The power that for so many centuries maintained despotic sway over the monarchs of Christendom is Rome. The purple and scarlet color, the gold and precious stones and pearls, vividly picture the magnificence and more than kingly pomp affected by the haughty see of Rome. And no other power could be so truly declared "drunken with the blood of the saints" as that church which has so cruelly persecuted the followers of Christ. Babylon is also charged with the sin of unlawful connectionn with the "kings of the earth." It was by departure from the Lord, and alliance with the heathen, that the Jewish church became a harlot; and Rome, corrupting herself in like manner by seeking the support of worldly powers, recieves a like condemnation. Babylon is said to be "the mother of harlots." By her daughters must be symbolized churches that cling to her doctrines and tradtions, and follow her example of sacrificing truth and the approval of God, in order to form an unlawful alliance with the world. The message of Revelation 14, announcing the fall of Babylon must apply to religious bodies that were once pure and have become corrupt. Since this message follows the warning of the judgment, it must be given in the last days; therefore it cannot refer to the Roman Church alone, for that church has been in a fallen condition for many centuries. Furthermore, in the eighteenth chapter of Revelation the people of God are called upon to come out of Babylon. According to this scripture, many of God's people must still be in Babylon. And in what religious bodies are the greater part of the followers of Christ now to be found? Without doubt, in the various churches professing the protestant faith. At the time of the their rise these churches took a noble stand for God and the truth, and His blessing was with them. But they fell by the same desire which was the curse and ruin of Israel - the desire of imitating the practices and courting the friendship of the ungodly. The message of the second angel did not reach its complete fulfillment in 1844. The churches then experienced a moral fall, in consequence of their refusal of the light of the advent message; but that fall was not complete. As they have continued to reject the special truths for this time they have fallen lower and lower. Not yet, however, can it be said that "Babylon is fallen,... because she made all nations drink of the wine of the wrath of her fornication." She has not yet made all nations do this.